When we first wrote to Hernan and his staff we were surprised with their response saying that they treat their clientes as friends. They weren't lying at all, the way Hernan and his staff made us feel since the beginning, listening carefully to our requests, answering our doubts and even they gave us some tips and suggestions to make our wedding photo session one of a kind. They are very professional in all the paperwork and setting up the times of our big day, we definitely put everything on their hands since we were very nervous on our wedding day. They arrived on time and we immediately knew who they were, wearing the biggest smiles and good vibes, that we felt confident with all their instructions, since we are not professional models! We just loved them, their work is above our expectations, and everything we could ever dream of! We will come back soon and I will definitely will choose Magic Art Wedding Studio again. 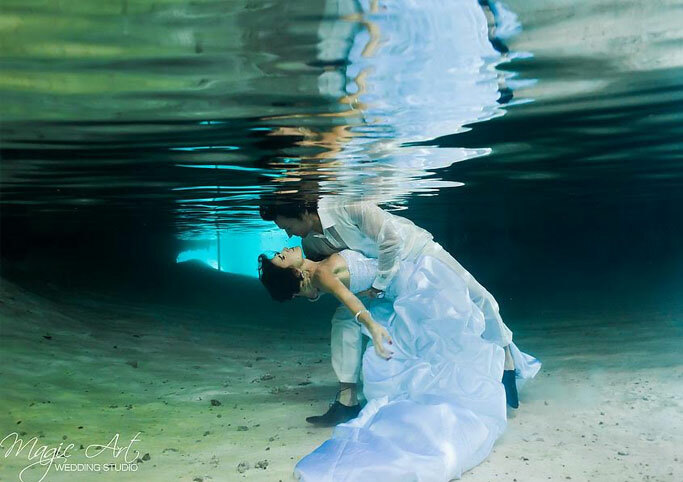 We decided to tied the knot in Playa del Carmen, but we didn't want an expensive ceremony and no reception, but what we truly wanted was to have a wedding photoshoot with our daughters and a underwater trash the dress. Searching the area for photo estudio we fall in love with the work of Magic Art Wedding Studio, so we gave a shot to write to them and express what we wanted to have while our trip to Mexico. They answer on time and even help us to find a minister who could married us right on a public secret beach. Hernan came to get us to our resort and we have to say that we trusted 100% on the first glimpse. We have a lovely private ceremony, and later a beach photo shoot, the session was so easy going, our daughters who are 7 and 8 years old, just have tons of fun with it. The next day we went to a magical cenote and even when I was scared to be with my wedding dress underwater Hernan and his assistant gave us so mucho confidence, that we were able to create a fairytale among with my beautiful daughter. 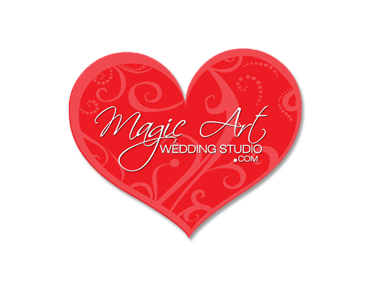 For sure Magic Art Wedding Studio creates stories full with magic, love and friendship! Thank you again so much!! Thank you Hernan for your superb work, we are truly amazed by our wedding photos. 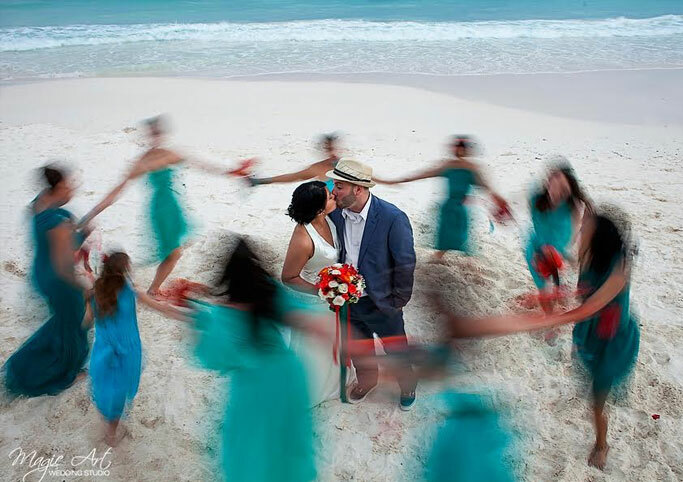 The photos are absolutely beautiful, you managed to capture our special day moment by moment along with the gorgeous tropical surroundings of Tulum. Every time we look at the images we are reminded of the emotion, the laughs, the magic and fun of the day. We are just coming back of an amazing honey moon where we wished to have you guys around so we can have all the places we visited and our happiness capture on photos! I wanted to drop you a quick email to thank you so much for all your hard work. I’ve had some time to go through the photos and I have to say they are simply beautiful! We’re so very happy with the images! You were so very polite and professional to all our guests too and both me and Chris felt so at ease all day.